We always like to include multiple layers of meaning within our corn maze. We like to have an aesthetically pleasing image that is fairly easily recognizable (this year it’s da Vinci’s “Vitruvian Man” aka “that guy, you know, the one in the circle with this arms out like this <insert realistic demo of arms outstretched here>, yeah, that guy”. However, our da Vinci guy is a cyborg–note the ray gun hand and the mechanical wing, not to mention the assorted gears for joints and a clockwork heart. Cyborg guy is shown not in a circle/square deal like da Vinci’s, but in the planar projection of a hypercube (aka a “tesseract”, aka “what are you talking about?”) So, a hypercube is like this: you know what a square is, right? Okay, now a cube is just a three-dimensional square. Still with me? A hypercube is simply a four-dimensional cube. ( Here’s a little more technical explanation.) Very cool. The gears are a nod to mechanical technology, especially the steam-era –aka Steampunk, which is also cool. We’ve got a little circuit-boardy stuff filling in the spaces on the lower right and mid-left. The knot-like thing in the lower left is, well, a knot, because knots are mathematically interesting. It’s made out of a carbon nanotube, which leads us into the fascinating world of nanotechnology. More info and links to come on all of these elements. Hi there, this looks wonderful and I’d love to feature it on my website. To whom can I credit it? We’re glad you like it! You can credit Treinen Farm Corn Maze and Pumpkin Patch. Wow what a cool looking place! We’ve only vitised a maze once while on holidays in Victoria, but our eldest was too young to really enjoy it unfortunately. I would love to take both my girls back there now that they would be old enough to really enjoy it! I’ll have to do some Googling and see if we have any around here..-= Caz s last blog .. =-. How cool to do a babomo maze! Looks like fun! 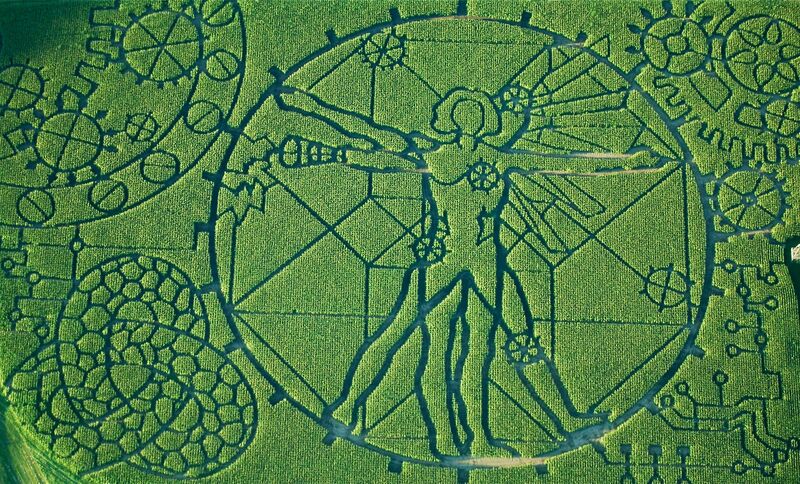 We have never done a babomo maze, but did do a corn maze back when we lived in Virginia.Popped by your neat blog from the We Play link ups. Hope that you will pop by my blog to say hi, too. Havea nice weekend,Colleen.-= Colleen Sunrise Learning Lab s last blog .. =-.